Now we might biased at Maude & Fox, but we can think of nothing more we’d rather unwrap up on Christmas morning than a gorgeous gift of tweed clothing. What better way to stay warm this winter? If you want to make someone’s Christmas this year, then don’t worry. We can still send out special delivery items to the UK until Tuesday. Our site has been updated to let you know what items of contemporary tweed clothing we have in stock. If you have any questions, the quickest way to get in touch is to give the team a call on 01258 489 628. Click to browse mens, womens, tweed accessories and tweed gifts for dogs. Finally, we would like to take this opportunity to wish all of our customers (not forgetting friends and family) a very Merry Christmas indeed. Our Aspen tweed hoodie is a real head turner. Maude & Fox create urban country chic. We interpret exquisite traditional fabrics for contemporary wear – including jackets, hoodies, gilets, skirts and accessories with practical flair. Our Aspen hoodie will certainly make you stand out from the crowd. With its luxurious mix of lambswool and angora, it’s perfect to wear as a glamorous spectator or for any social event requiring a bit of warmth and a lot of elegance. The Aspen is fully lined with a smooth fabric which gives the hoodie a beautiful drape. See more photos of this stunning tweed via the links below. Now this IS a gift you’ll want to open up on Christmas Day. Maude & Fox brings the traditional shooting jacket bang up-to-date with the Brace Shooting Jacket. 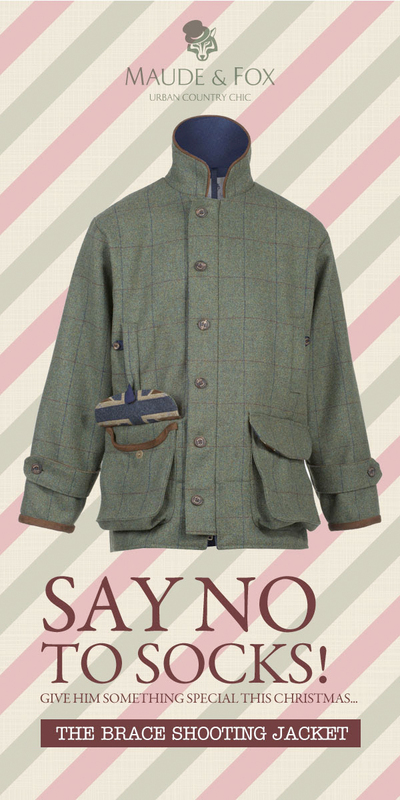 This tweed shooting jacket clearly demonstrates our commitment to quality and style. The new tweed shooting jacket is aimed at the discerning chap or lady who’s looking for some individuality in the field but without being too overt. ‘The Brace’ combines function and comfort with clever contemporary styling. Made from 100% British tweed, with a soft anti-pill fleece lining for extra warmth, the jacket also offers superior comfort to allow freedom of movement in the upper body and arms. Unusual technical detailing includes a vented bellow pocket with the underside pocket flap made in a quirky patriot tweed with a magnetic fastening (much less fiddly on a cold winter morning! ), a zipped inside breast pocket for a phone, special fleece lined hand warmer pockets just below the chest and stag-horn buttons. View more info and detailed photos. 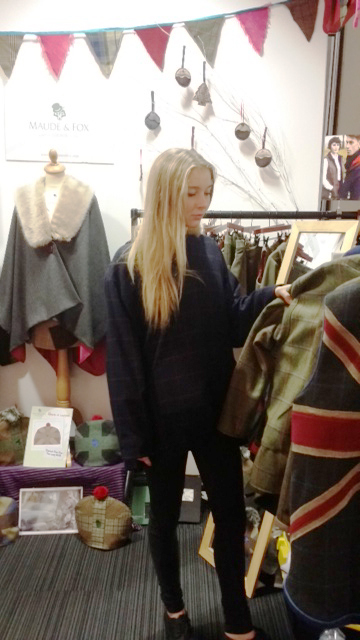 In this photo (taken at London’s recent Country Living Christmas Fair) Linnea can be seen wearing our dark blue Aspen. The Aspen is a beautifully glamorous item of tweed clothing and suitable for anything, anywhere. 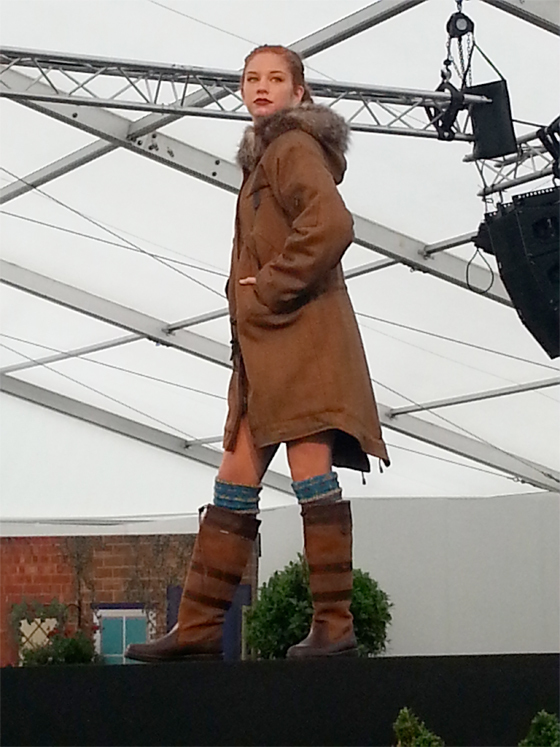 But making it’s show debut in the back of this picture is our latest contemporary clothing design, the Maude & Fox Tweed Cape. We think it looks fab in soft grey. Features include a pink lining and a comfortable honey faux fur collar that feels wonderful on your neck. The tweed cape’s design means it’s super easy to fling on over everything. The grey colour will work with many outfits, but hints of pink flashing in view from the back hemline will ensure you get noticed too. Our new tweed cape will cost £330.00. Be one of the first to find out when it becomes available by signing up for the Maude & Fox newsletter. Just add your name and email to the bottom of this page. Today marks the first ever ‘Buy British Day’. And what could be more British than heading out for a country walk and stopping off for a pint and ploughman’s. all whilst wearing some unique British tweed clothing? Tweed with a twist, Maude & Fox is all about making urban country chic come to life through combining traditional materials and great design to make contemporary clothes that can be worn by lad or laird alike. Based in rural Dorset, all our clothes are selected from mills in Yorkshire and Scotland. Each garment is made by one person throughout, ensuring that attention to detail and quality are key. 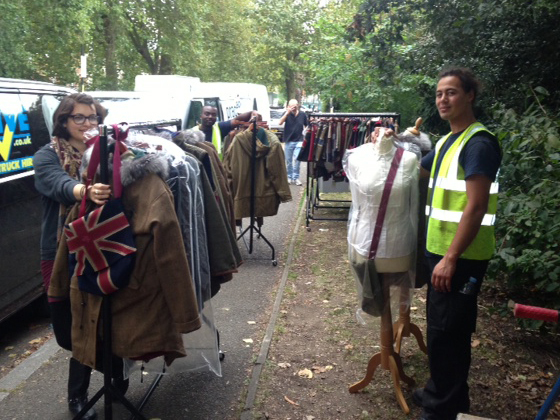 So spruce up your Autumn wardrobe by buying British today. Shop mens contemporary tweed clothing. Shop womens contemporary tweed clothing. 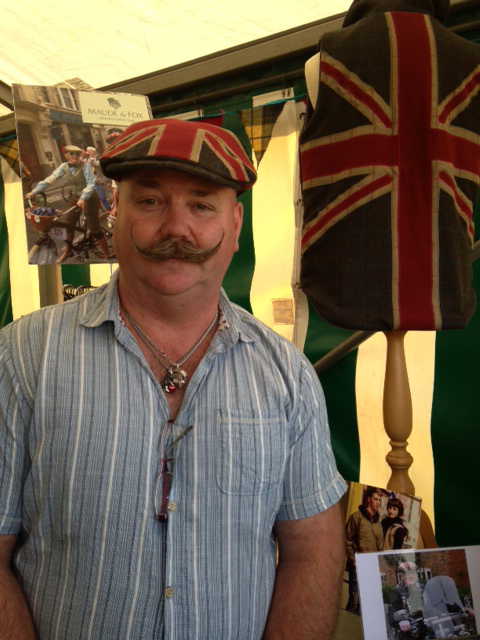 Here’s a photo of Mark flying the flag at the recent Royal County of Berkshire Show. As you can see Marks is the proud owner of a rather fabulous moustache too, officially it’s the 3rd best handlebar moustache in Britain. If you’re feeling as patriotic then check out our Patriot Cap. It’s made in our Dorset studio from 100% British tweed and sports an eye-catching Union Jack in red appliqué tweed and is fully lined. 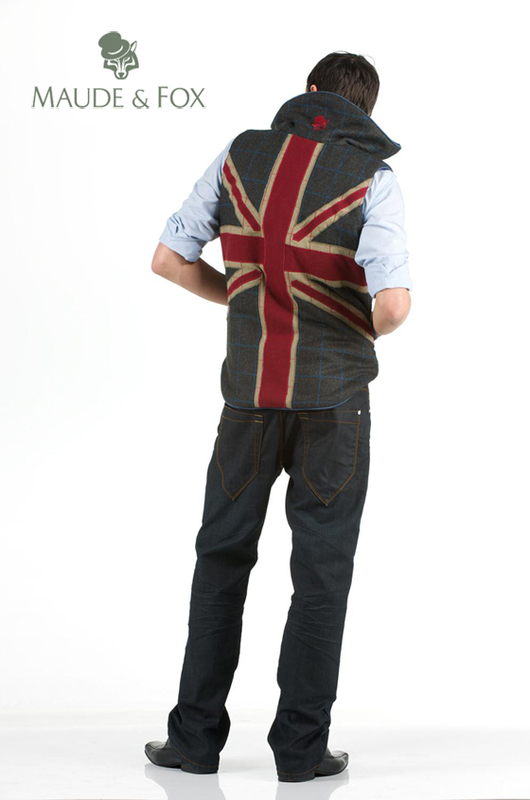 Shop our tweed Patriot range. The 2014 Chatsworth Country Fair took place over the recent August Bank Holiday Weekend. 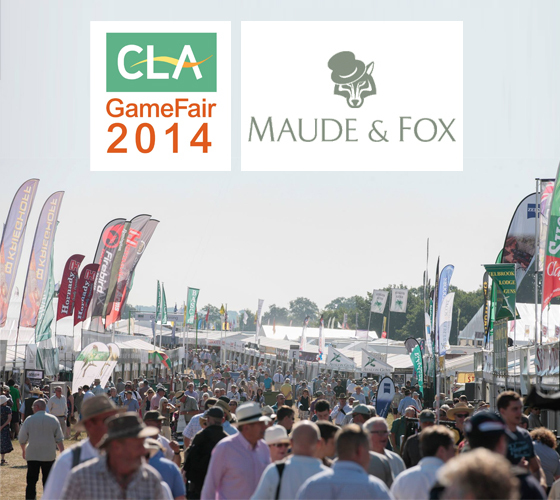 This show is a favourite of ours with crowds of up to 100,00 heading to stunning grounds of stunning Chatsworth House. There was also plenty of action up in the air this year with a tribute to the airmen of World War 2 by the Royal Air Force in their Battle of Britain Memorial Flight. Another sight to behold at the fair were the many wonderful hot air balloons that took to the skies. We managed to get a picture of one directly above our tweed show stand. 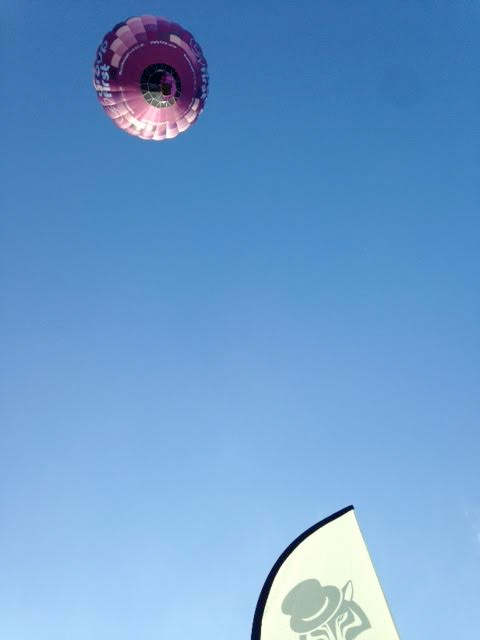 In fact, one of the balloonists from the day ended up buying one of our tweed Patriot caps so is now proudly flying the flag, as well as a hot air balloon. View our entire range of tweed caps and country clothing accessories.